Happy October everyone! Autumn is officially here! Currently I'm in the process of planning and sewing my perfect fall wardrobe. So, I'm here to show you my first fall make! The pattern is from My Image magazine. My Image is a Dutch based sewing magazine created by a Jet and Martin. I'm always up for trying new sewing magazines and books, so I was really excited to see what this one had to offer! And I wasn't disappointed! The magazine comes with 16 sewing patterns for women in sizes 34-52(XS-3XL) and contains instructions in 5 different languages!! !The designs are modern and really well drafted, and the instructions are clear and easy to follow. I choose to make the M1665 dress/top. I cut a size 38 for the bust, grading to a size 40 for the waist and hips, but I did modified the pattern a little. I wanted to make a long top with open sides, since I have a RTW summer top like that which I love. Since I wanted a more flowy fit, I straightened the side seams (connect the underarm with the hem with a straight line). I used the dress length of the pattern for the back and I shortened the front by 16,5cm. Lastly, I only sewed the sides for 12cm under the armhole. The neckline is finished with a binding and I used a twin needle for the sleeves, but I left all hems and side seams raw, because..., well ain't nobody got time for that! 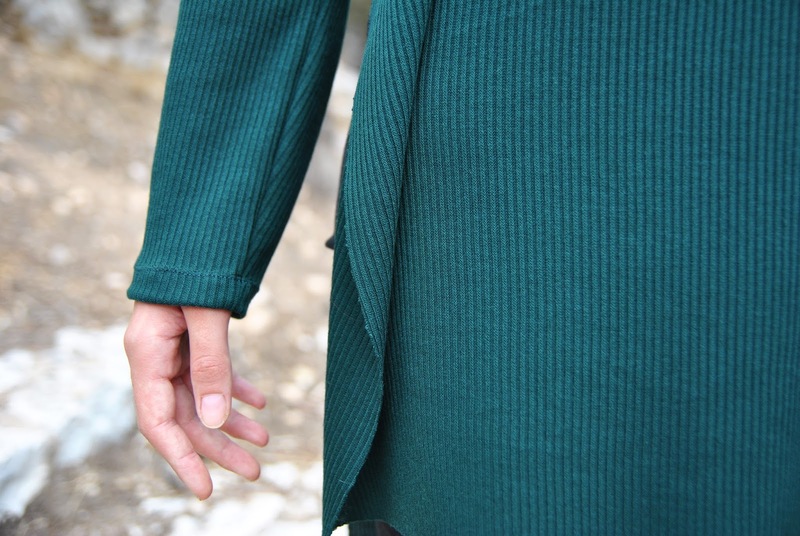 I used the loveliest, softest ribbed knit in a gorgeous evergreen color, which gave the perfect drape to this top! I really love this top! It is cosy, comfy and has plenty of room for all the fall pastry eating I'm planning on doing! I don't know about you, but it ticks every singe thing in my list! And I really recommend checking out the magazine! Jet and Martin were kind enough to give a 25% discount on all their products until the 1st of November! Just enter the code: wardrobe. They also have a lovely magazine full of children's sewing patterns, called B-Trendy, that is really worth checking out! So, how about you? What is on your sewing table right now?